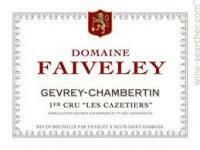 2017 Faiveley Gevrey Chambertin Les Cazetiers - $79.99: Vins Rare, The finest selection of rare wines. Burghound (Allen Meadows) 91-94 "Sweet Spot. Outstanding." Fine Wine Reveiw (Claude Kolm) 92-96 "Faiveley purchased Dupont-Tisserandot back in 2013; the original Faiveley and the Dupont-Tisserandot plots are blended in this wine. The nose is floral. Spicy blackberry fruit in mouth with finesse, subtlety, and elegance. The wine is medium-light on the palate and juicy. Good length. One can drink this wine young, but it has the balance for good aging. A complete wine."